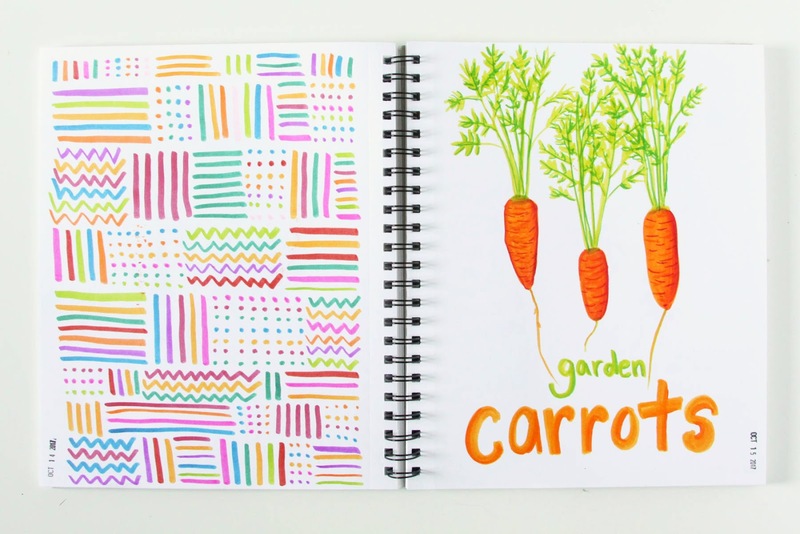 Almost every week I share a conversation with an artist who works in sketchbooks. These artists give encouragement and share tips from their experience. What tools they like to work with. How to stay motivated and inspired. 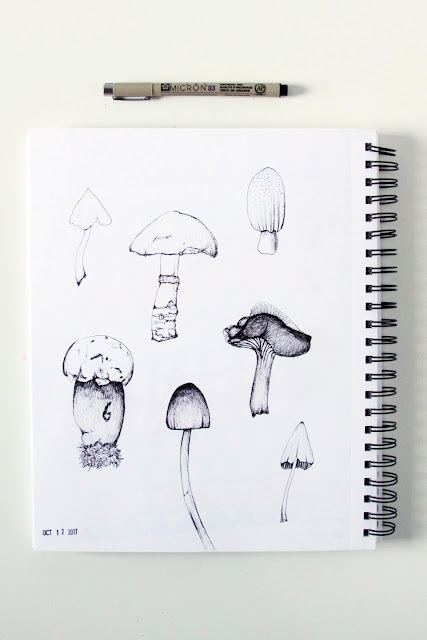 I started this series after my 2x2 Sketchbook collaboration with Dana Barbieri ended because I wanted to dig deeper into reasons and uses for sketchbooks, because I wanted to connect with other artists and because I wanted to continue to inspire you (and me, too). I've shared my own thoughts on keeping a sketchbook in this space (including my history with sketchbooks). Working in sketchbooks wasn't a natural thing for me and there was an enormous hump of fear, uncertainty and feelings of intimidation for me to scale before I was able to get comfortable with the practice. 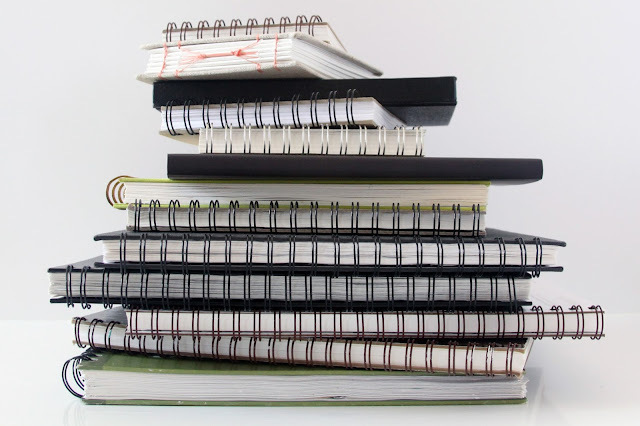 Now I have quite a few sketchbooks in process that I use in different ways. But to be honest, it has been a LONG time since I've worked regularly (every day or almost every day) in a sketchbook. The more time that passed, the harder it was to face the possibility of that blank page. I'd pick up my main book when I was working on a project... I have rough planning and practice for commissions in there. 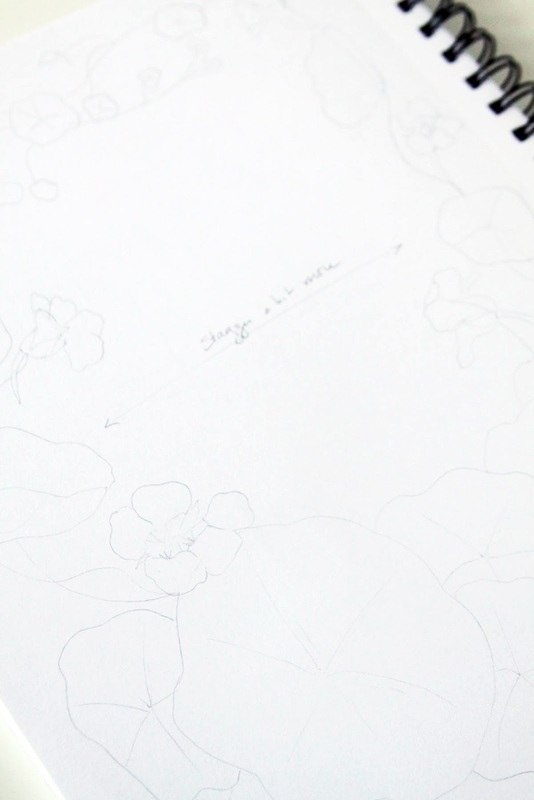 I have three pages of pencil sketches from when I was working out the design for my Nasturtiums Tea Towel Calendar. But daily sketches? Ive fallen out of the habit of them. It's easy to do. Life gets in the way. We're busy, tired, uninspired. The why doesn't matter. The real question is how to get back into the habit once you've fallen out of it. I put my sketchbook and my box of markers on the coffee table in our living room with the intention of making it easy to pick up in the evening if we're watching something on Netflix or Amazon. Day after day the sketchbook and box of markers sat there unopened. Some days I had good reasons (excuses). We were watching something with subtitles. I had a cat on my lap. * Other days I was just too tired or uninspired or not sure what to draw. I took my sketchbook with me when we went on vacation last month. Brought some markers, pens, the set of Inktense pencils I've been wanting to play with and a water brush to try. The supplies weighed down my backpack and their presence weighed me down, too. Other than filling my water brush with water from Lake Michigan, I didn't touch my art supplies. Back home I felt bad about not having done any sketching on vacation. I put my sketchbook on the coffee table, again, and scolded myself. But, again, it just sat there. I felt guilty. Inadequate. And the fact that week after week artists were sharing their thoughts about keeping sketchbooks here on my blog made me feel like a hypocrite. Then last week I made myself pick up my sketchbook and markers. No secret. No trick. I just picked up my book and doodled some wonky triangles in a vaguely quilt-like design. It wasn't great, but it was something. And then the next day I picked up my book again. It's not easy to overcome the inertial of inaction. It's not easy to face a blank page. Maybe it's harder when we're constantly faced by other people's pages that look pretty damn good (I'm almost certain that 100% of their pages don't look as good as you think they do). Really, there's only one way to do it. And that's to pick up the sketchbook and get busy. Last week Jen McCleary talked about how doing something is always better than doing nothing. It's the habit that matters, not what's on the page. Inspiration, being in the mood... they're not prerequisites. It's so very true. And it doesn't only apply to sketchbooks. Whatever habit you're cultivating, just do it. Don't think about it. Don't worry over it. Just do it. What practice have you been resisting lately? How are you going to make sure you get to it? 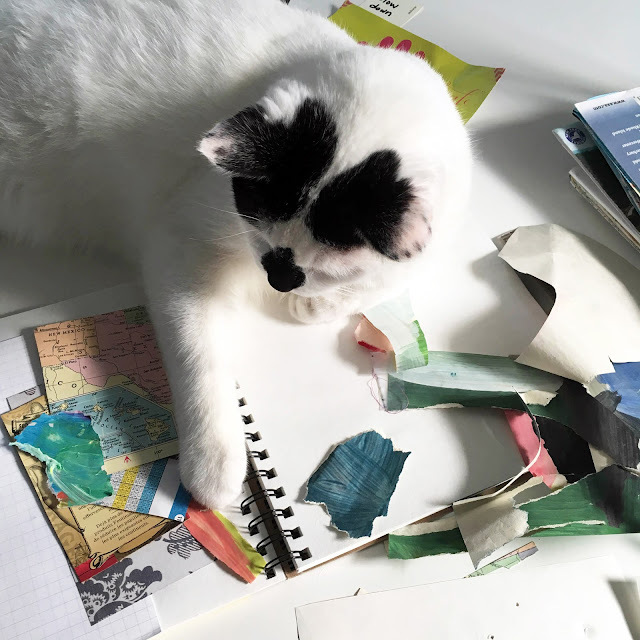 *When I read the book Your Inner Critic is a Big Jerk by Danielle Krysa I was struck by how many of the excuses artists gave for not making art involved their cats. I thought those excuses sounded pretty lame. At the time we didn't have a cat. After we adopted our current cats, I realized, again, how much cats can get in the way of things like working in a sketchbook. I'm glad you found your way back to your sketchbooks. I was looking at one today and it was a work of art on its own. There's so much pressure (internal and external) to do this or that. I'm beginning to realize if I don't truly enjoy said thing I'm not going to do it. Life is too short. I say if you want to work in them do it. If not don't beat yourself about it. Of course this doesn't apply to all the have to's in life I realize. Just my 2 cents. You're so right. Why do what we don't like doing (unless, as you said, it's necessary... we can't suddenly decide never to vacuum again). That being said, sometimes we shy away from things, not because we don't enjoy them, but because we put too much pressure on ourselves, or feel pressure from outside ourselves, allowing fear, not joy to guide us. Fear of not being good enough or of our sketchbook pages looking not as good as someone else's. I don't know if there is an easy solution to that, but eventually we can quiet our inner critics. But definitely, don't spend time on something you don't enjoy. (Unless it's vacuuming, in which case, enjoy the end result!). I can so relate to this, I carry a sketchbook and pens, have one by my sofa, etc. I really want to sketch but can't think of what to sketch. I know, big excuses. 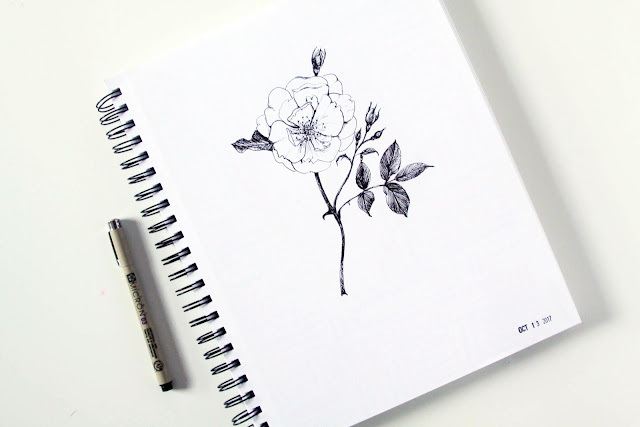 I love your sketches and really appreciate your sketchbook conversations. Thank you for sharing yours. In the sketchbook conversation I posted today Frida Hammar says she keeps a list of ideas and she's never without something to sketch. Could be helpful when you're feeling stuck. I know, though, we'll find an excuse no matter what. Pushing past the excuses isn't easy, but it's worth it. As long as you actually enjoy the sketching (Dana has a good point about not spending time on what you don't like to do). Thanks for being here sharing your thoughts! We can all do this together! Love that photo of your kitty on your sketchbook, Ann! Yes, that happens to me too! Oh, I know exactly what you're talking about - my sketchbook has lived on my coffee table forever, "unsketched in" most of the time! It usually takes something like a challenge to get me to do something consistently! I'll be doing Art Every Day Month again in November - maybe that will spur me on. Love your drawings, BTW! Quin is so funny. Well, both cats are, actually. I let them in my studio most of the time, but sometimes I just need to temporarily banish them so I can get things done! Whatever works to keep us motivated is a good thing. Whether it's a challenge or some other "trick". I'm excited that you'll be doing Art Every Day Month again, Judy. Makes me smile to think that that's where we first met! Thanks for being here and thanks for the encouragement! Glad to hear you're back on the wagon. I have been sketching every day for the past 4 years (and nearly every day the 2 years before that). Whenever people ask me for tips on how to do this successfully, my only tip is this: Lower your standards about what qualifies for sketchable. Some days I sketch things I am interested in. But many, many other days, I simply drive to an errand, and before I get out of my car, I sketch the car in front of me. Or a garbage bin on the sidewalk. Or a telephone pole. No inspiration required. As you say, the "doing" is the important part. Keep at it! Ha! That's a great tip... lower your standards. Another way of putting it (at least for me) is to loosen up. My art tends to be so detailed and that takes time. Letting go and allowing quick sketches (and doodles and play) is a good thing. Thanks for stopping by and thanks for sharing your thoughts, Tina! Hahaha! Yes, cats can't resist that sort of thing (when they're not sleeping, that is). Hope you've been finding time to be creative, even if it's not in a sketchbook. Dana's right that if we don't enjoy something, we shouldn't do it (and definitely not beat ourselves up over not doing it! ).